The Frank H. Fleer Company had been making bubble gum since the 1920s but only dabbled in card issues occasionally through the 1950s. Sitting on the sidelines as other companies battled it out over exclusive player rights, Fleer kept their focus on profits and the bottom line. Eventually realizing that in order to maintain and grow their market share, they would have to throw their hat in the trading card ring, the company ended up making an aggressive pitch to one of the most popular players of the era. When they successfully negotiated an exclusive contract with the Boston Red Sox star slugger, Ted Williams, it gave them a big boost. Despite being well on his way to winding down his career in 1959, Ted Williams was still one of the best and most popular players in the game. The 1959 Fleer Ted Williams Baseball card set chronicles the Splendid Splinter's exploits, both on and off of the field. From being the last hitter to reach the .400 mark, earning two Triple Crown awards and a host of milestone hits and highlight-reel plays, all are included in this cardboard biopic of Williams' life. 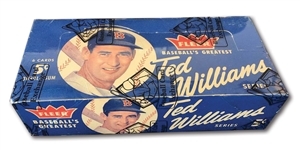 Presented here is a magnificently preserved unopened 1959 Fleer Ted wax box containing twenty-four original unopened 5-cent wax packs, each of which houses six cards, for a total of 144 cards. The box looks factory fresh and ageless, as if it was just removed from a case, ready for placement on the candy store shelf. The box has been authenticated and shrink-wrapped by BBCE (Baseball Card Exchange), the industry standard for unopened authentication. A similar box recently fetched nearly $34,000 at auction, reflecting the hobby’s increasingly insatiable appetite for top-quality vintage unopened material.